Want to see a Halo movie? So does GI Joe: Rise of Cobra writer Stuart Beattie, which may be why he's giving interviews about the potential movie despite the project being assumed dead in Hollywood. Viralpushforanon-existentmovie go! 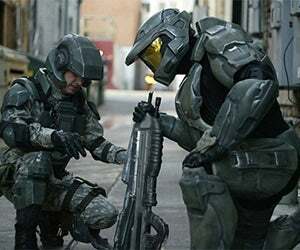 I just think it's an amazing story about this child that no one cares about and who cares for no one else, who kind of ends up saving all of humanity... "I wouldn't want to stand in the way of it getting made, but I firmly believe that the first Halo movie needs to be the Fall of Reach story, because it sets up all the characters, the world, the Covenant, the big struggle between mankind and the aliens, all that stuff... that's where my money is. But why make a Halo movie in the first place? I think not every video game should be made into a movie, just like not every book should be made into a movie. Not every comic book should, but certain ones definitely should, because they're so visual, the characters are so rich and the mythology is so vast that they should. Halo is definitely one of the shoulds... It's like our generation's Star Wars. The whole Halo nation that's out there, and a 100,000-year history of the Halo universe, it's just breathtaking and so much fun to play in that sandbox. I've read every book, played every game, every graphic novel. It's just a fun world to be in. And, as every wish made on the internet comes true in some strange way - just try it, if you don't believe me - Beattie's IMDB listing already lists his fantasy Halo movie as having been announced. Now that's fast.